Plant workers help machines sort through materials at Casella Waste Systems’ recycling center in Charlestown. Philadelphia is now burning about half of its 1.5 million residents’ recycling material in an incinerator that converts waste to energy. In Memphis, the international airport still has recycling bins around the terminals, but every collected can, bottle, and newspaper is sent to a landfill. And last month, officials in the central Florida city of Deltona faced the reality that, despite their best efforts to recycle, their curbside program was not working and suspended it. Those are just three of the hundreds of towns and cities across the country that have canceled recycling programs, limited the types of material they accepted, or agreed to huge price increases. Amid the soaring costs, cities and towns are making hard choices about whether to raise taxes, cut other municipal services, or abandon an effort that took hold during the environmental movement of the 1970s. 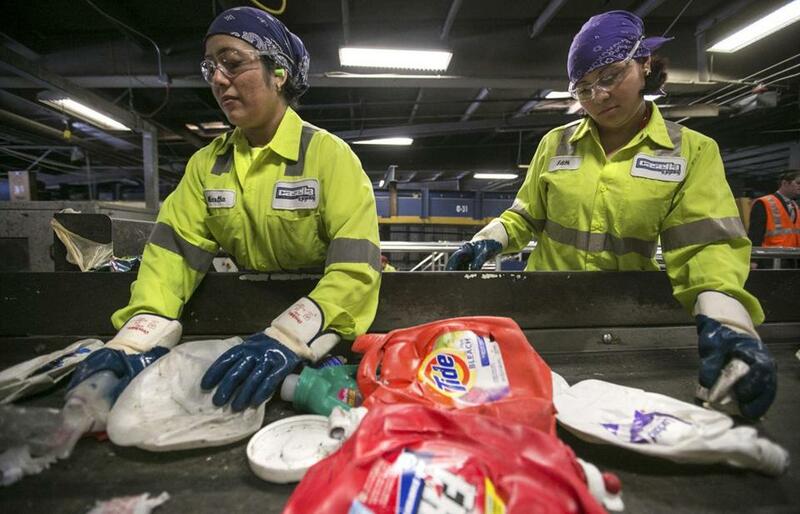 Higher recycling fees, analysts say, will bolster the largest companies’ already booming businesses. Waste Management reported strong operating profits in 2018, while Republic reported increased revenue driven by its waste business. “It’s not what most people think of as recycling, but it is better than the alternative,” Ryan said. When China was buying cardboard and plastics, recycling made money for Philadelphia some years. But last year, the city was hit with an “outrageously high” price increase, a city spokeswoman said in a statement. The city came up with what it says will be a temporary solution. It identified the neighborhoods with the most contamination in recycling bins and started sending their material to an incinerator in nearby Chester, Pa. The rest still send their material to a recycling facility. This month, a lobbying group for Connecticut municipalities, citing the chaos in local recycling programs, urged the governor to focus on restricting plastic bags, straws, and packaging. “We want to ensure that we are able to have a seamless transition if and when single-stream recycling returns to the Memphis area,” the spokesman, Glen Thomas, said in an e-mail.